The ageless struggle: do I bake these cookies or just eat all this delicious dough? It's plagued us for eons. SO-when I saw my girl Baker Bettie's post with Chocolate Chip Cookie DOUGH Cookies...I mean...I HAD TO TRY THEM! Obviously. Who are we talking about here? MEEEE. As it turns out...this is more of a method than a recipe (although the recipe below uses Baker Bettie's fave chocolate chip cookies and is pretty darned awesome)--it's essentially just baking the cookies at a higher heat for a shorter time so that they're delightfully underbaked inside. Turns out...I've done this (partially by accident) many times in my past so I was actually pretty familiar with it. No complaints, though! 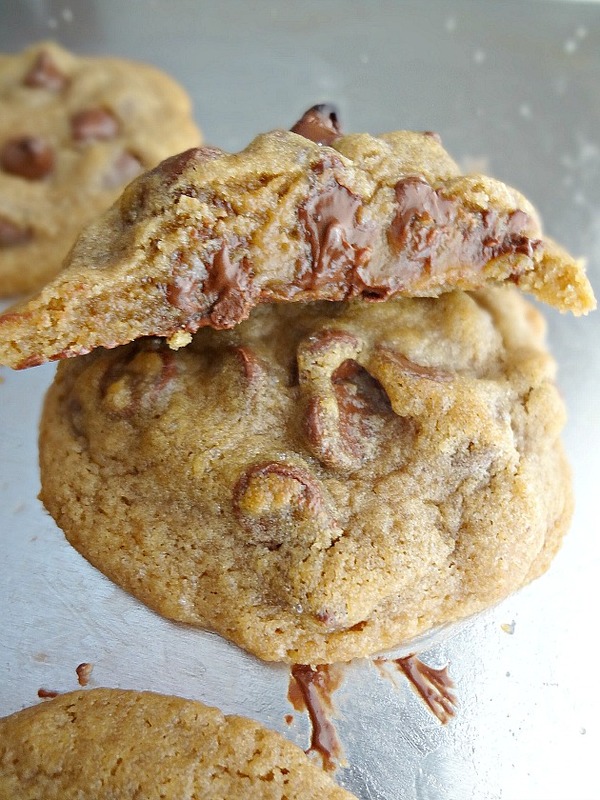 I am never going to turn down a warm, ultra-gooey cookie (plus, they're pretty gooey even when not warm)! Now...is it what I thought? No--for the best-of-both-worlds between cookie/cookie dough I'm sticking with my cookie dough balls. BUUUT...again...I got to eat some tasty tasty cookies because I made these. And I'm never complaining about that. And if you haven't tried this method already...you should def. give it a shot--at least once! Put it on your bucket list or whatev. Preheat oven to 500F degrees and prepare a large baking sheet by lightly spraying with nonstick cooking spray or lining with parchment paper or a silicone baking mat. In a large bowl (using a hand mixer or a stand mixer fitted with the paddle attachment) cream together the butter and sugar until fluffy-about 1 minute. Beat in the egg and vanilla extract for another minute, scraping down the sides of the bowl as needed. Mix in the baking powder, kosher salt, and flour until just incorporated. 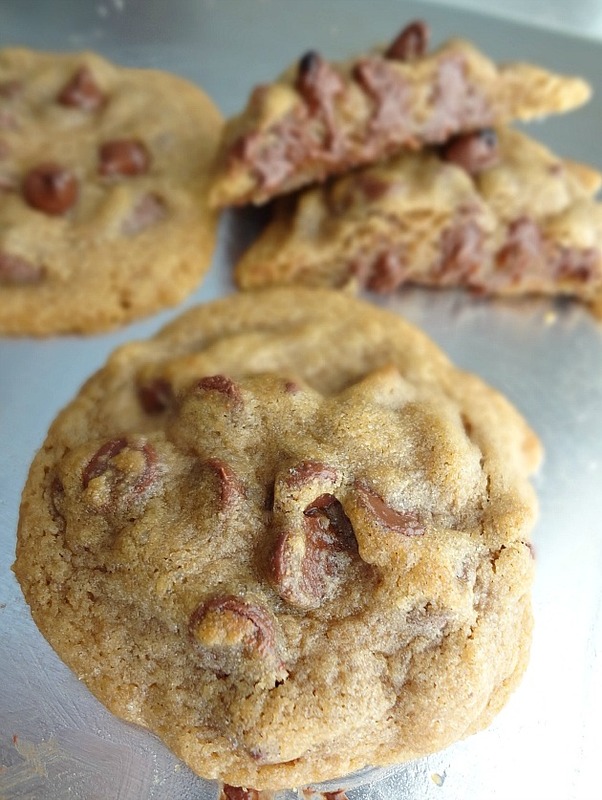 Using a rubber spatula or a spoon, mix in the chocolate chips until evenly combined-don't overmix. Use a large scoop, or a 1/4 cup measuring cup, to scoop large rounded mounds of dough onto the prepared baking sheet. Flatten the dough slightly with the palm of your hand. Top each piece of dough with more chocolate chips, if desired, and a bit of sea salt. Bake for 4 and 1/2-5 minutes. Remove and let the cookies cool on the sheet for at least 20 minutes, they'll solidify as they cool. Store leftovers in an airtight container at room temperature or in the refrigerator for up to 3 days. 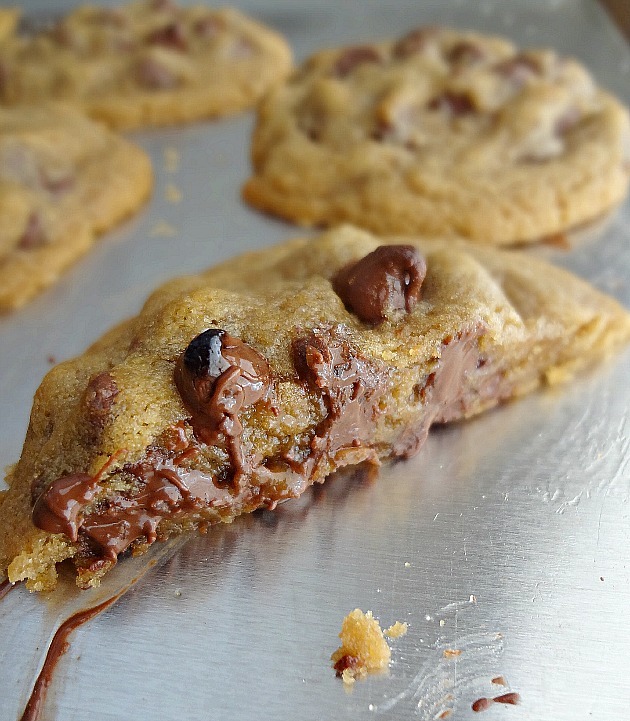 I will never not love a good chocolate chip cookie. NEVAH!